For over 30 years Setrab oil coolers have dominated at every level of motorsports worldwide. Manufactured in Sweden under the strictest quality control, there is no better way to control oil temperatures on your race car, high performance street car or tow vehicle. The tasks of engine oils are to lubricate, to seal and to prohibit corrosion. If the properties of the oil deteriorate, the consequence is wear and reduced life expectancy. In the worst case, an engine working at excessively high oil temperatures can be subject to engine failure. 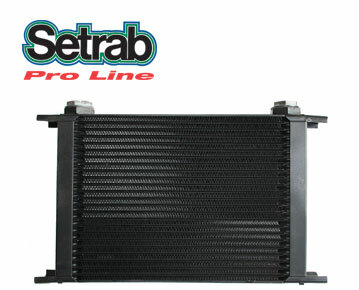 Setrab oil coolers are efficiently designed to ensure maximum performance from your engine oil. Oil coolers aren't only for engine oil. They can be used to prolong the life and performance of transmissions, differentials and power steering systems too. We also carry remote oil filter kits, hose and fittings to facilitate installation. Custom made hoses are also available upon request.